Plan ahead so that you can register as soon as possible. Many classes fill and waitlists can be long! Early registration also helps to make sure there are enough students to keep the class from cancelling. Pay your fees immediately. Your class registration is not confirmed until fees have been paid or until a financial aid application is on file and aid has been awarded. Additional information about financial aid and how to apply can be found on the Fees & Financial Aid page. Select the class(s) you want from the Summer Session Schedule and make note of the four digit Class#. You can also search for classes in your Student Services Center account by selecting the summer term. 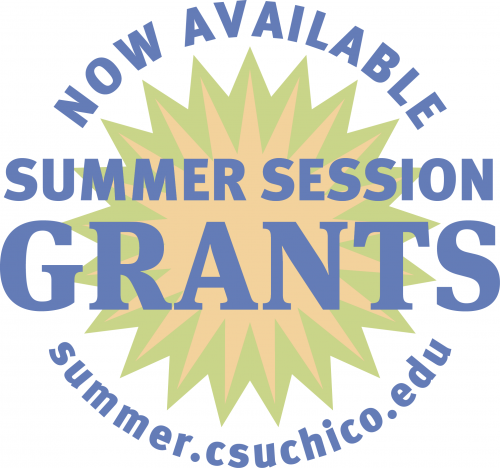 Log into the Chico State Portal and select the Records, Registration, and Finances tab. Under the "enrollment" section, select "add a class" and follow the same steps used to add classes for fall and spring. Refer to the Adding Classes Help Guide if you have questions. If you want to pay fees through the Student Center, select "Make a Payment." If paying by credit card (Discover, American Express, Visa or MasterCard) or electronic check, login to CashNet to post a payment to your account. Credit card payments made through the Student Center are subject to a 2.75% service fee. If you are paying with a Visa or MasterCard, call the Continuing Education office at 530-898-6105 or stop by with your check payment. No service fees are charged. You can also make a payment at the Student Financial Services office, SSC 230 if paying by check or cash. The final day to register for classes through the Portal is May 16. Beginning May 17 you can enroll through Continuing Education online, by phone, or in person [see below]. You can continue to pay fees through the Portal even after registration has closed, though credit card payments processed through Continuing Education are not charged a service fee. If you are a new Chico State undergraduate, or a graduate student admitted or readmitted for fall 2019, you need to register through Continuing Education [see below]. It is recommended you speak to an academic advisor before selecting a Summer Session class. If you have applied for spring graduation, but need to take a summer class to complete your degree, you must reapply for summer graduation by submitting a new Graduation Application and pay the required filing fee. Once your fee payment has been confirmed, contact the Student Records Office at 530-898-5142 to request "term activation." Once you are term activated, you can enroll in open summer classes through the Student Center in the Portal [see above]. If you have questions or need assistance with your term activation request, contact Continuing Education, 530-898-6105. Use the Continuing Education online registration request process if you are paying with a Visa or MasterCard. Select the class(s) you want from the Summer Session Class Schedule. From the class detail page, select Register Now. Provide your contact information and submit your payment through our secure system. If you are paying with a Visa or MasterCard, call the Continuing Education office at 530-898-6105. Visit the Continuing Education Office on the Chico State campus between 8am-5pm Monday-Friday. You can pay by credit card, check, money order, or cashier's check. If a class is full, you may add your name to the waitlist. Students are moved from the waitlist on a first come, first served basis into a class as space becomes available. You must be eligible to enroll in the class to be moved from the waitlist to enrolled status. Students added to a class will be sent an an email notification. Fees must be paid immediately or the registration will be cancelled. Fees can be paid in your Student Center or through Continuing Education [see above].